It’s a beautiful summer day—sunny, breezy, not too hot. You and your friends are tossing a Frisbee in the park. You run to catch it and step into a hole. You feel your ankle twist and you collapse into a heap. You pick yourself up, but there is something really wrong. You cannot put any weight on that foot—not without major agony. A few hours later, after the X-ray has shown nothing is broken, you are sitting at home with your foot propped up with an ice bag on an ankle that looks like it belongs to Dumbo, the elephant. Your doctor says you’ll be fine in a week or two. He recommends rest, ice, elevation, and maybe some aspirin or ibuprofen. No more summer fun for you for a while! Well, there’s always cable, you think. But before you settle into channel surfing, think about that bottle of aspirin or ibuprofen. How can one little medicine do so many things? It relieves your pain, reduces the inflammation (swelling), and generally makes you feel better. You take it when you have a fever, and maybe your grandmother or grandfather takes it to prevent heart attacks or relieve pain from arthritis. Is it one single chemical or a mixture of several substances? Aspirin, ibuprofen, and other nonsteroidal anti-inflammatory (NSAI) drugs are each single molecules from a class of chemical compounds called arachidonic acid pathway inhibitors. Arachi-who? Let’s back up and take a closer look at the arachidonic acid pathway and the wonderful world of prostaglandin synthesis. Prostaglandins are a very important member of the lipid family of molecules in the human body. Lipids are all the molecules that are soluble in nonpolar solvents (like oil) and insoluble in polar solvents (like water). Lipids include fats, oils, steroids (like cholesterol), and prostaglandins. Prostaglandins are made of carbon, hydrogen, and oxygen and have a five-membered ring, two carbon chains, and assorted double bonds and other groups. They have wildly descriptive and romantic-sounding names like: PGG2, PGF1", and PGI2. Prostaglandins are extremely powerful chemicals and do their jobs at very low concentrations. They mediate some rather uncomfortable and unpleasant bodily processes. They are involved in pain, inflammation (swelling), fever, blood pressure regulation, menstrual cramps, labor, blood clotting, and asthma attacks. Furthermore, biochemists are, even now, hard at work discovering new prostaglandins and trying to determine what they do in the body. Every single prostaglandin molecule in your body comes from the same “parent molecule”, a long-chain fatty acid called arachidonic acid. The body converts arachidonic acid to the first prostaglandin, PGG2 with the help of a well-named little enzyme called cyclooxygenase (COX1 for short). It forms a ring (the “cycle” part) and adds an oxygen molecule, O2. See the “oxygen” in the middle of the word? From PGG2 the body makes PGH2, and then the party starts. At this point, the chain branches, and PGH2 is converted into a wide variety of prostaglandins. Your body turns on and off various enzymes that can act on PGH2, depending upon which prostaglandins it needs. After you shoved your foot in that hole, several prostaglandins from PGH2 were synthesized and pressed into service. You have them to thank for the pain and swelling, as well as the clotting of the various blood vessels you broke that will make your ankle ultimately turn a variety of interesting shades of blue, purple, and green. What is the benefit of the body synthesizing chemicals that make you so miserable? In a backward way, it is a self-protective measure. that’s where the NSAIs come in. Let’s go back to the Middle Ages. You are a countess in England, and you are suffering from a crippling headache. Or, if you prefer, you are a knight in shining armor with a wicked black eye from a fight with a dragon. Either way, your servant brings you a draught of willow bark extract. “Please milady (or milord), drink it! You’ll feel better!” You grimace, close your eyes tight, and down the awful concoction. It does make you feel better even though it tasted dreadful and made your stomach a bit queasy. What was in that willow bark extract? Willow bark contains a chemical called salicin, which is converted to another chemical called salicylic acid in your body. Salicylic acid is one of the many compounds that act as NSAIs; however, it is extremely irritating to the stomach and mucous membranes. In 1897, a German pharmacist and chemist named Felix Hoffmann, working for Bayer, found a solution for that bitter pill and acetylated salicylic acid, meaning that he replaced the hydrogen on the –OH groups with a -C(O)CH3. 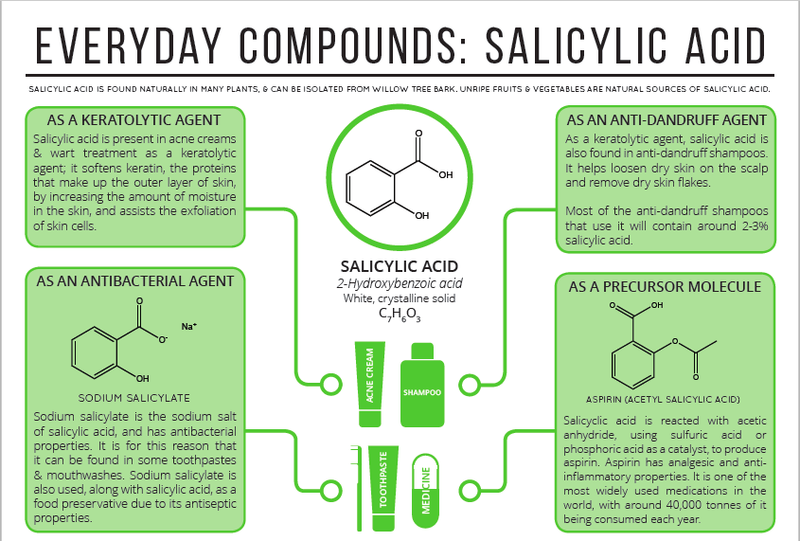 This compound is called acetyl salicylic acid. This made the drug much more tolerable to the stomach, and the Bayer Company quickly marketed the miracle, pain-relieving, fever-lowering, anti-inflammatory drug under the trade name, “Aspirin”. Another player on the pain and fever relief scene is acetaminophen, the active ingredient in Tylenol. Even though it was first synthesized by Harmon Morse in 1873 and used medically in 1893, acetaminophen didn’t really get medically popular until after World War II. However, acetaminophen does not relieve as many symptoms as aspirin (more on that later). The 1970s saw the discovery of ibuprofen and naproxen. These two drugs were found to be as effective or more effective than aspirin and even less irritating to the stomach. We are lucky to live in a time when there are a variety of ways to effectively treat pain. So how do all these molecules work in the body? Aspirin, ibuprofen, and other NSAIs inhibit the arachidonic acid pathway early in the process—at the cyclooxygenase step to be precise. These chemicals are called competitive inhibitors. They compete with the arachidonic acid for cyclooxygenase, binding with it so that the arachidonic acid cannot. If the enzyme is busy with the NSAI, it cannot do its job on the arachidonic acid. Voila! You stopped the first step, and the whole process shuts down. The prostaglandins responsible for pain won’t get made, nor do the ones for inflammation, fever, or clotting. Actually, some still get made, just nowhere near as many as usual. That’s why the NSAIs seem to be such wonder drugs—they inhibit the formation of all of the prostaglandins, which have so many widely different functions. Some people talk about how “aspirin thins your blood”. It doesn’t really; it just makes the blood clotting mechanism less effective because clotting is controlled by two prostaglandins. So since aspirin inhibits the formation of those prostaglandins, they cannot form. That is how aspirin helps protect those with heart disease from heart attacks. Ibuprofen is better than aspirin at blocking the action of cyclooxygenase, which is why it is more effective at pain relief and fever reduction. Some folks are allergic to aspirin or find that it and other NSAIs upset their stomachs. They may take nonaspirin pain relievers, such as the acetaminophen mentioned above as alternatives. Acetaminophen does a good job of relieving pain and also works well on fevers, but it doesn’t help with inflammation, nor does it offer the reduced clotting protection for those with heart disease. Why does acetaminophen do some of the things that NSAIs can do but not others? The answer lies in where the acetaminophen inhibits the arachidonic acid pathway. Acetaminophen doesn’t inhibit cyclooxygenase like the NSAIs. It works on an enzyme further down the pathway. At this point the pathway has already branched somewhat and the prostaglandins responsible for clotting and inflammation have peeled off. By inhibiting the pathway further down, acetominophen only works on fever and pain. Next time you play the game, “Shipwrecked on a Desert Island and Only Allowed to Have One ….” (book, CD, person, etc. ), you can pick an NSAI as your one medicine. Most doctors would. So even though a lot of people pooh-pooh the advice:“Take two aspirin and call me in the morning,” as a brush-off from the doctor, you can now appreciate that aspirin and all of its NSAI buddies represent some pretty powerful and effective medicinal chemistry!